Or perhaps you’re really going to pluck the cherry from the tree and have all three? The first thing that strikes you is the colour - the deep purple really brings the ornament to life and lends it that realistic cherry-type appeal. They are all moulded to exacting standards with curved lines and realism from polymer fiberglass that offers a finished product that’s tough, hard wearing and not liable to cracks and splits with the occasional knock that will be expected after it’s displayed. Particularly as it will definitely be an instant talking point with family and friends without a doubt. They will remain unaffected by the elements throughout the year, simply needing a quick wipe over every now and again to restore the attractive gleam that can be seen in the photo. 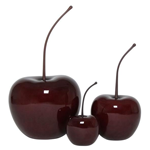 We also sell a Double Cherry Ornament.